Just a few little niggles hold the Yoga 900 back from perfection. Even so it's absolutely worth its money and needs to be on the considerations list for anyone looking for a classy Ultrabook. Laptops are going through a change. But is it a kind of growing-up or that last pre-retirement crisis? Machines like the Lenovo Yoga 900 and Microsoft Surface Book want us to believe it's more the former than the latter. The Lenovo Yoga 900 takes what we had with the Yoga 3 Pro, rips out the weak-but-nimble Core M processor and then replaces it with a meaty Intel Core i7. Yet somehow it's still really slim and light, and long-lasting too. Indeed it's the slimmest Intel Core i machine on the market. With no dedicated GPU, however, it's not quite as interesting as the Surface Book. But it's only really some trackpad issues and little screen complaints that take the shine off the ultra-high-end display specs that hold the Yoga 900 back. And even then, they don't spoil this elegant, incredibly portable package much. Here's why it's well worth considering buying one. We've seen designs much like the Lenovo Yoga 900 a few times before. Lenovo has made 360-degree hinge laptops for years, and even the fancy design of this one seems familiar. But it ain't half lovely looking. Rather than using a pair of hinge points like a regular laptop lid, the Lenovo Yoga 900 has what look like bits of a stainless steel watch strap running down the length of the join between keyboard and screen. Looks fancy, doesn't it? Sure enough, Lenovo calls it the "watchband" hinge and says it's made of a jaw-dropping 813 pieces. This hinge moves freely, and is clearly meant to draw your eye and make rivals look a bit boring on the shelf in the PC store. There's no way to really dumb down the look, though. When you're using the Yoga 900, the silvery watch bits don't half glint at you, looking totally different from the sober black inside. 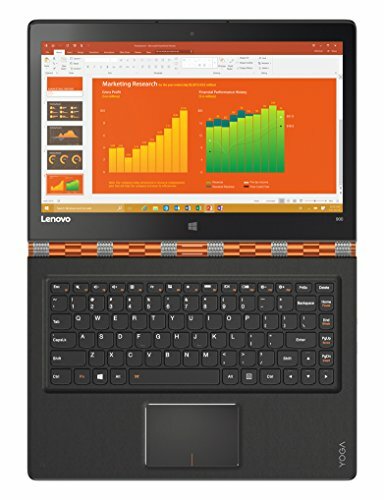 You can get the Yoga 900 with champagne or bright orange links instead, but these are even less neutral-looking if anything. Still who doesn't like a tiny bit of bling? The Yoga 900 will make a 13-inch MacBook Air look old news if you plonk it down next to it. Not that that's hard to do these days. The construction aside from the hinge is a little unusual too. Much of the frame is magnesium, while the inner keyboard area has a leather finish. The effect is closer to a soft-touch plastic with a bit more character, before you get any funny ideas about it looking like the interior of a Mercedes, though. This isn't an Alan Partridge laptop. The real question: do you want a flip-over hinge or a hybrid where the screen part actually pops off? Each has its benefits. On the flex-hinge side, you don't have to treat the Yoga 900 too nicely. The hinge can be moved about quickly and without much care, into an orientation that keeps the screen propped-up in front of you. With a detachable hybrid, you generally need to be a bit more careful because what you're really dealing with is a pair of things that hook up with magnets or clasps, which may detach if sat the wrong way. What you don't get with the Yoga 900 is a particularly good portable tablet experience. For the lounge factor we'd probably take a Surface Pro 4. Consider the Yoga 900 as more of a laptop than a tablet hybrid and it gets straight As for design. It's light for a laptop with a full-on Intel Core i7 CPU at 1.3kg, and it's super-skinny. Nipping out for a meeting at a coffee shop, it really doesn't feel too odd to just hold the laptop under your arm rather than putting it in a bag. You wouldn't do that with a fusty old work Dell machine. There's a good array of connections too, at least as long as you care most about portable use. You get two USB 3.0 ports, a new-fangled USB-C port, and the power connector can be used as a bonus USB 2.0 port. Given how often we've had to crack out a USB hub just to avoid hot-swapping cables on the MacBook, this is a very neat extra. Alongside these ports you get an SD card port and the usual headphone jack. There's no HDMI port, which is an unsurprising shame, but the USB-C connector is designed to handle video output. You can hook this system up to a bigger screen, but you'll need an adapter. If you're getting the gist: the Yoga 900 may have a fast CPU, but it's still absolutely an ultraportable, not a desktop-replacer. The Lenovo Yoga 900 screen has the sort of specs that'll make you forget about other computers anyway. It has a 3200 x 1800 pixel IPS LCD panel, which puts it on-par with high-res laptops like the latest MacBook Pros and the Microsoft Surface Book. Sitting next to our usual MacBook Pro 13, we couldn't help but notice there are a few little lacking factors, though. The Yoga 900's screen is more reflective and at mid-level brightness the black level does seem a little raised, making it look ever-so-slightly low on contrast compared with some other £1000-plus laptops. And while very sharp, right up close there's an effect where straight vertical lines don't appear totally pure and straight. Some have suggested this is down to software sharpening, but to our eyes it looks more like the layers of consecutive pixels are offset by a sub pixel. Have we been staring at the screen too long? Maybe, but you can afford to be picky when you're spending this much. We haven't seen the Surface Book screen yet, but it might be a mite better. Other than these little issues — and we're being hyper picky, because that's our job — the Lenovo Yoga 900 has a cracker of a display. It feels tough even though it's dead slim, has a very responsive touchscreen and can be held at any angle with no major wobble or fall-off to colour and contrast. The colour tone is nice too, with a just slightly warmed-up colour temperature that's soothing on the peepers. If you're upgrading from a 1080p or, god forbid, a 1366 x 768 pixel laptop then you're going to love the Yoga 900. Much of what we've covered so far was found in the Lenovo Yoga 3 Pro too. What's new in the Yoga 900 is the CPU. The Lenovo Yoga 900 has an Intel Core i7-6500U, 16GB RAM and a 512GB SSD, at least in the spec we're reviewing (which costs £1,489, rather than the entry-level £1,299). You really can't fit more power into a case this skinny without risking it melting through your thighs as soon as you open more than one browser window. The pay-off is that while the lower-power Core M-powered Yoga 3 Pro can get away with passive cooling for the most part — using heat sinks instead of fans — the Intel Core i system of the Yoga 900 does have a fan. You wouldn't know a lot of the time, though, as it's nice and quiet. In normal operation, the Yoga 900 is just about silent, helped by the exclusive use of an SSD for storage. HDDs make all kinds of little clicking and whirring noises. The one time the Yoga did start sounding a bit like a toy Hoover was when we tried to play Skyrim at 3200 x 1800 native resolution. It wasn't a sensible plan, as it runs like a dog at anything but the lowest settings. And even then it's only just about playable. However, drop to 1080p and Skyrim runs just fine, though — which is a bonus over a Core M alternative. You get a bit more graphics grunt from the Yoga 900, and can play some games of the recent past if you cut down the settings a bit. Most of the time we see laptops like the Yoga 900 out, people aren't doing anything remotely CPU challenging on them, though. It does have everything it needs to handle properly CPU-boilers like video processing, mind. Just look at the list: 16GB is a lot of RAM, while the 512GB SSD is about 5x faster to read/write than a fast HDD. There's around 50 per cent more power than the Yoga 3 Pro in the Yoga 900, which is no bad thing. When we've used Core M laptops for everyday low-demand work, they've honestly performed about as well as this machine. However, the performance ceiling is way higher in the Yoga 900. So, will you appreciate the extra power enough to spend the cash? Back to the day-to-day grind stuff and the keyboard — much like the other slim Lenovo laptops — has keys a lot shallower than the classic ThinkPad keyboards you might associate with Lenovo laptops. The action is crisp, though, and typing would be a delight if it didn't take quite as long as it does to get used to the Lenovo Yoga 900's cut-down keys. Like several small laptops, the shift and backspace keys have been filed away and turned into nubs of their former selves. You'll get used to this style in the end, but it took us quite a while. And the process was a bit frustrating. But at least you get a keyboard backlight to ensure typing in dim light is easy. However, the trackpad below has some less subjective issues. On occasion it doesn't respond to swipes, as if the thing's driver keeps nodding off in the background. Hopefully a driver update will solve this. Other than that the trackpad feels good, particularly for one on the smaller side now that so many companies have taken to mimicking Apple with giant trackpads. Good performance, decent keyboard action and supreme portability make the Yoga 900 the perfect road warrior buddy. Its stamina is good for an Intel Core i7 system too. Using it as an everyday work laptop, we got just about a full day's graft out of a charge. You can expect around 7.5 hours, which you may be able to push up to Lenovo's claim of 9-hours if you don't use the internet much and cut down the screen brightness a bit. Apparently that's how long their tech team got it to last playing locally-stored video at 200 nits screen brightness with Wi-Fi off. The one bit we haven't covered yet is the Lenovo Yoga 900's speaker array which, unusually, delivers varying sound results depending on how the laptop sits. Its speakers sit on the curvature of the underside, a pretty common spot. Sat on a flat surface and the Yoga 900 speakers sound reasonable, but open up much more when the Yoga 900 is in its tent position. Physics-wise it makes a lot of sense, as the drivers aren't firing right into a hard surface. The Lenovo Yoga 900 is the laptop that has it all in many ways. It looks good, feels good, lasts for a good while off a charge and has lots of power on tap. Just a few little niggles hold it back from perfection: the keyboard is annoyingly designed when a 13-inch frame should give it enough room to work with; the screen isn't quite the best at this spec level; and the trackpad seems a touch buggy. Saying that it's absolutely worth its money, though, and needs to be on the considerations list for anyone looking for a classy Ultrabook. One of its only downsides might be that the recently announced, smaller-scale and yet slimmer 900S model may hold yet more appeal.